Mirandolese was the pupil of Marcantonio Chiarini, one of the dominant personalities among the prospettive painters in Bologna during the first half of the eighteenth century. 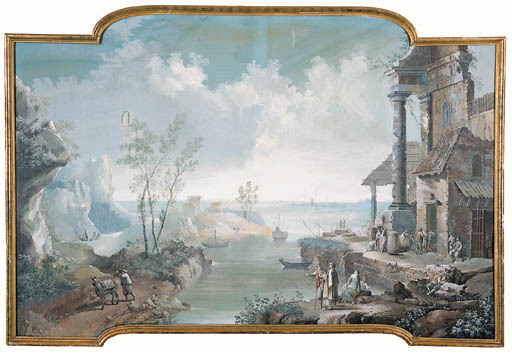 The present work can be compared to four architectural capricci dating from around 1724 sold in these Rooms, May 18, 1995, lots 91 ($210,000) and 92 ($90,000). In those paintings, like this larger landscape, the staffage was by Bigari. Tempera was one of Mirandolese's preferred mediums, two examples of which, one dated 1724, are in the Galleria Davia Bargellini, Bologna. For other works by the artist, see R. Roli, Pittura Bolognese, 1977, pp. 207-8, pls. 385c-388b.